Dejan Gavrić was born in Belgrade in 1966. He started playing flute at the age of 11 and gave his first concert only a year later. From 1984 to 1988 he studied at the Faculty of Music Arts in Belgrade. Upon receiving a scholarship to continue his education at the Folkwang Hochschule in Essen, he became a student in the studio of Professor Matthias Rütters. He graduated from Folkwang Hochschule with honors in February 1991 As a student he received the First Prize at the Folkwang-Hochschule Competition, as well as the prestigious Folkwang Award for his overall artistic achievements. In 1993, after completing his postgraduate studies with honors at the same institution, Gavrić became a Professor at Folkwang Hochschule. He has won awards at various international competitions, including the Maria Casals Competition in Barcelona (Spain) and the Leonardo De Lorenzo Competition in Viaggio (Italy). During his studies in Belgrade, he appeared as a soloist with The Belgrade Philharmonic Orchestra and The Belgrade Radio Television Symphony Orchestra on multiple occasions. He has performed at BEMUS Festival (Belgrade, Serbia) and Summer Music Festival (Split, Croatia), and has also made recordings for Belgrade Radio and Television. Gavrić’s engagements as a soloist and ensemble member have taken him to England, France, Spain, Austria, Italy, Germany, Japan, and USA, including appearances at The Marlboro Music Festival, Hitzacker Musiktagen and Rheingau Musikfestival. He is regularly asked to be a jury member at flute competitions and he teaches master classes in Europe, Japan and Korea. Dejan Gavric played at Flute festivals in Germany(2014,2017),Hungary(2008),Slovenia(2012),Brazil(2015). Graz. 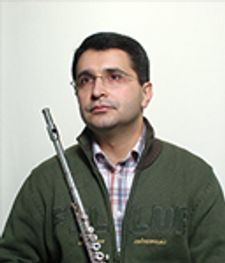 Since 2002 Dejan Gavrić has been employed as a Full Time Professor for Flute at the Hochschule für Musik Mainz.  Strasho Temkov is one of the most successful Macedonian music artists. He studied at Faculty of Music in Skopje and postgraduate studies at the Music Academy "Pancho Vladigerov" in Sofia. Straso Temkov performed as first flutist at the Macedonian Philharmonic from 1991-2010 and performed as a soloist with several orchestras - Ho Chi Minh Symphony Orchestra, French-American Chamber Orchestra, Nice Symphony Orchestra, Chamber Orchestra of the Macedonian Philharmonic Orchestra, Macedonian Chamber Orchestra, Amoroso Chamber Orchestra, Lady Chamber Orchestra, etc., He was soloist with numerous recital programs, a member of the renowned "Macedonian Wind Quintet" trio "Aura" and other chamber ensembles. Strasho Temkov performs at renowned music festivals in the country and abroad: "Ohrid Summer", "Autumn Music Festivities", "Skopje Summer", "Days of Macedonian Music", "Herakleian Dinners", "Art Apollonia" - "Salon of Art" -Sofia R. Bulgaria, "NIMUS", "LEDAMUS" - Serbia, "Espressivo" -Cetting, "Barski leaflets" -Bar, International festival of chamber music "-Nikšić C.Gora," Baščaršijski nights "-Sarajevo BiH, Makarska Summer ", Zagreb, Rijeka, Osijek, Prelog-Croatia, Italy, France, England, USA and others, and performed in "CARNEGIE HALL NEW YORK USA - one of the most prestigious concert halls in the world." Straso Temkov's repertoire covers the periods from Baroque to contemporary music. He also published two CDs in collaboration with pianist Marija Vrskova, produced by MMM and DUU-SKOPJE SUMMER. Apart from the artistic activity, Strasho Temkov is a professor at the Faculty of Music Arts - Skopje, mentor of undergraduate and master studies. Strasho Temkov is the winner of the prestigious "Golden Lira" award, awarded by the Association of Music Artists of Macedonia for top art achievements. Miomir Simonović has acquired his Bachelor’s and MA degrees at the Faculty of Music in Belgrade in the class of Prof. Tahir Kulenović. During his studies, he won numerous awards at national and international competitions and was awarded the third prize at the 23rd Yugoslav competition for young artists in Zagreb in 1989. He has attended masterclasses of eminent flutists such as Prof. Allain Marion and Prof. Raymond Guiot, and in year period 1987-1989, as a scholarship holder for the Scientific and artistic youth of Serbia, he attended conservatory "Hector Berlioz" in Paris under the mentorship of Prof. Raymond Guiot. He has held over fifty recitals in Belgrade and many other cities in Serbia, but also in FYR Macedonia, France and Spain. He has performed as a soloist with Niš Symphony Orchestra, Symphony Orchestra RTS, the Serbian Army Orchestra and the Chamber Orchestra "Amorosso". He has been acting as a pedagogue since 1987, first in the Music School "Jovan Bandur" in Pančevo, then in schools "Josip Slavenski" in Belgrade and "Živorad Grbić" in Valjevo. During postgraduate studies was a teaching assistant in Prof. Tahir Kulenović's class. 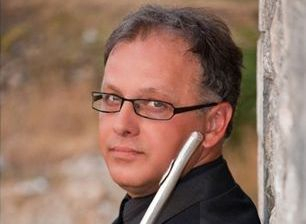 He has been employed at the Faculty of Music in Belgrade since 1997 as an assistant and now as a full professor of flute. In his class has graduated 35 students so far, some of whom continued their education abroad, while others are teachers throughout Serbia and members of various orchestras (Belgrade Opera Orchestra, Symphony Orchestra RTS Orchestra chamber opera "Madlenianum"). Students from the class of Miomir Simonović so far have won over 60 awards at national and international competitions. 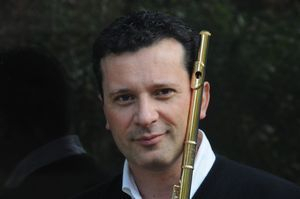 Miomir Simonović is a permanent member of the flute choir "Belgrade siringa", with whom he had several concert appearances and issued a CD with music by Bach, Haydn and Mozart.